Welcome to Bin Han's Web Page! Time-scale-frequency analysis: wavelets, multiwaveltes, framelets, and sampling theory. Application of wavelets and framelets to signal denoising and image compression. Book: Bin Han, Framelets and Wavelets: Algorithms, Analysis, and Applications, Applied and Numerical Harmonic Analysis, Birkhauser/Springer, Cham, (2017), 724 pages. Bin Han, On linear independence of integer shifts of compactly supported distributions, Journal of Approximation Theory , Vol. 201 (2016), 1-6. Bin Han, Qun Mo, and Zhenpeng Zhao, Compactly supported tensor product complex tight framelets with directionality, SIAM Journal on Mathematical Analysis , Vol. 47 (2015), Issue 3, 2464-2494. Bin Han and Xiaosheng Zhuang, Smooth affine shear tight frames with MRA structure, Applied and Computational Harmonic Analysis , Vol. 39 (2015), 300-338. Bin Han and Zhenpeng Zhao, Tensor product complex tight framelets with increasing directionality, SIAM Journal on Imaging Sciences , Vol. 7 (2014), Issue 2, 997--1034. Bin Han, Matrix splitting with symmetry and symmetric tight framelet filter banks with two high-pass filters, Applied and Computational Harmonic Analysis , Vol. 35 (2013), Issue 2, 200-227. Bin Han, Properties of discrete framelet transforms, Mathematical Modelling of Natural Phenomena , Vol. 8 (2013), Issue 1, 18--47. Bin Han, Nonhomogeneous wavelet systems in high dimensions, Applied and Computational Harmonic Analysis, Vol. 32 (2012), Issue 2, 169--196. Bin Han, Gitta Kutyniok, and Zuowei Shen, Adaptive multiresolution analysis structures and shearlet systems, SIAM Journal on Numerical Analysis, Vol. 49 (2011), 1921--1946. Bin Han and Xiaosheng Zhuang, Matrix extension with symmetry and its application to symmetric orthonormal multiwavelets, SIAM Journal on Mathematical Analysis, Vol. 42 (2010), issue 5, 2297--2317. Bin Han, Dual multiwavelet frames with high balancing order and compact fast frame transform, Applied and Computational Harmonic Analysis , Vol. 26 (2009), 14--42. Bin Han and Zuowei Shen, Dual wavelet frames and Riesz bases in Sobolev spaces, Constructive Approximation, Vol. 29 (2009), Issue 3, 369--406. Bin Han and Zuowei Shen, Compactly supported symmetric C^\infty wavelets with spectral approximation order, SIAM Journal on Mathematical Analysis , Vol. 25 (2009), 407--414. Bin Han, Refinable functions and cascade algorithms in weighted spaces with Holder continuous masks, SIAM Journal on Mathematical Analysis , Vol. 40 (2008), 70--102. Bin Han and Zuowei Shen, Wavelets with short support, SIAM Journal on Mathematical Analysis , Vol. 38 (2006), Issue 2, 530--556. Ingrid Daubechies and Bin Han, Pairs of dual wavelet frames from any two refinable functions, Constructive Approximation , Vol. 20 (2004), No. 3, 325--352. Bin Han and Qun Mo, Splitting a matrix of Laurent polynomials with symmetry and its application to symmetric framelet filter banks. SIAM Journal on Matrix Analysis and its Applications , Vol. 26 (2004), No. 1, 97--124. Bin Han, Computing the smoothness exponent of a symmetric multivariate refinable function, SIAM Journal on Matrix Analysis and its Applications , Vol. 24 (2003), No. 3, 693--714. Ingrid Daubechies, Bin Han, Amos Ron, and Zuowei Shen, Framelets: MRA-based constructions of wavelet frames, Applied and Computational Harmonic Analysis , Vol. 14 (2003), No. 1, 1--46. Bin Han, Michael L. Overton, and Thomas P.-Y. Yu, Design of Hermite subdivision schemes aided by spectral radius optimization, SIAM Journal on Scientific Computing , Vol. 25 (2003), no.2, 643--656. Bin Han, Analysis and construction of optimal multivariate biorthogonal wavelets with compact support, SIAM Journal on Mathematical Analysis , Vol. 31, No.2 (1999/2000), 274--304. Bin Han and Rong-Qing Jia, Optimal interpolatory subdivision schemes in multidimensional spaces, SIAM Journal on Numerical Analysis , Vol. 36, No. 1 (1998) pp. 105-124. Bin Han and Rong-Qing Jia, Multivariate refinement equations and convergence of subdivision schemes, SIAM Journal on Mathematical Analysis , Vol. 29, No. 5 (1998), pp. 1177-1199. Bin Han, On dual wavelet tight frames, Applied and Computational Harmonic Analysis , Vol. 4 (1997), no. 4, pp. 380-413. PIMS CRG Grant on Applied and Computational Harmonic Analysis, April 2011--March 2014. NSERC Research Grant, April 2009---March 2014. NSERC Research Grant, April 2004---March 2009. Canada Fundation for Innovation (CFI) infrastructure fund (with Michael Li and Samuel Shen) to establish an Information Research Laboratory. NSERC Research Grant, April 2000---March 2004. University of Alberta start-up fund, July 2000--April 2002. Elana Gnida, NSERC summer undergraduate student, May 2012--August 2012. Zhenpeng Zhao, Ph.D. in applied mathematics, September 2010--August 2015. Award: 2015 Faculty of Science Dissertation Award. NSERC Postdoctoral Fellowship (declined). Ph.D. Thesis: Directional tensor product complex tight framelets, August 2015. Patrick Conner, NSERC summer undergraduate student, May 2010--August 2010. Xiaosheng Zhuang, Ph.D. in applied mathematics, September 2005--August 2010. PhD Thesis: Interpolating Refinable Function Vectors and Matrix Extension with Symmetry. Currently, tenure-track assistant professor at City University of Hong Kong. Xinghua Deng, Ph.D. in mathematics, September 2002 -- July 2008. Co-supervised with Professor Robert Moody at the Department of Mathematics, University of Victoria. PhD Thesis: Discrete point sets with long-range order and associated point processes. Mengzhe Wang, Ph.D. candidate in mathematics, December 2003 -- January 2005. Robert Liao, M.Sc. in applied mathematics, January 2003 -- June 2004. M.Sc. Thesis: New interplatory subdivision schemes in computer graphics, 2004. Stephen Wasylishen, NSERC summer undergraduate student, May 2003--August 2003. Qun Mo, Ph.D. in mathematics, November 2000 -- August 2003. PhD Thesis: Compactly supported symemtric MRA wavelet frames, 2003. Currently, an associate professor at Department of Mathematics, Zhejiang University, China. Paul Shelley, M.Sc. in computing sciences, December 2000 -- August 2001. Co-supervised with Professor Xiaobo Li at the Department of Computing Sciences. MSc Thesis: New techniques in wavelet image compression, 2001. 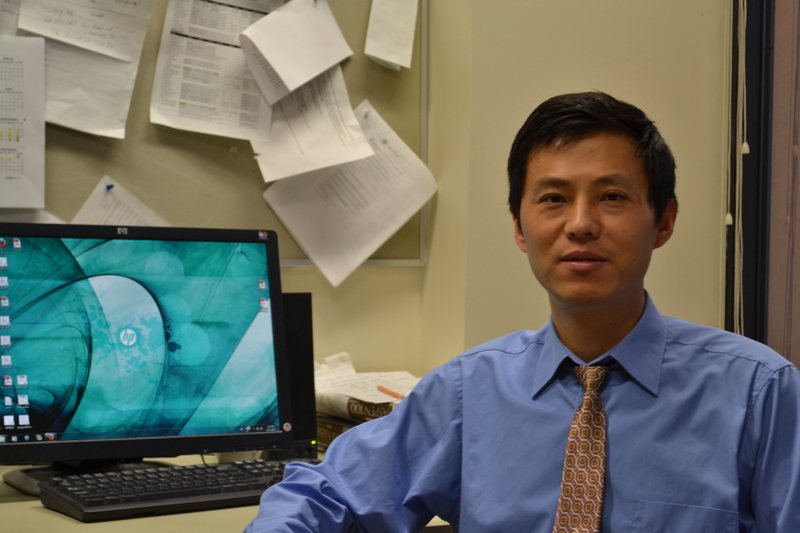 Dr. Yi Shen, PIMS postdoctoral fellow, September 2012--August 2014. Co-supervise with Professor Elena Braverman. Dr. Mpfareleni Rejoyce Gavhi, NRF postdoctoral fellow, August 2012--August 2013. Dr. Soon Geol Kwon, Visiting professor from Korea, February 2004--February 2005. Dr. Sang Soo Park, KOSEF postdoctoral fellow, October 2003 -- September 2004. Dr. Wen Chen, PIMS postdoctoral fellow, September 2001 -- August 2003. Co-supervise with Professor Rong-Qing Jia. Currently, a full professor at Department of Electronical Engineering, Shanghai Jiaotong University, China. International Conference on Wavelets and Applications, Saint-Petersburg, July 8-15, 2012. 13th International Conference on Approximation Theory, San Antonio, Texas, USA, March 7--10, 2010. The International Conference: Wavelets and Applications, Saint-Petersburg, Russia, June 14-20, 2009.